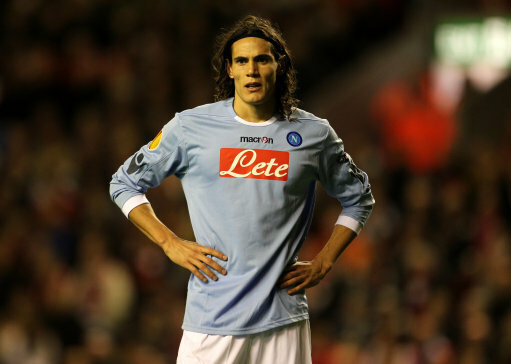 Napoli hitman Edinson Cavani will NOT be joining Manchester City (or anyone else for that matter) any time soon, with his agent rejecting outright any speculation that his client may be on the verge of a big money move away from the Stadio San Paolo. I still get the feeling that an offer of around €50 million may change all that though. Cavani may be good, but he sure-as-sh*t isn’t that good. Claudio: Surely a bid of €50+ million from Man City would entice Napoli/Palermo (or whoever actually owns him) into selling? Good for Cavani. He would have been rubbish at City (like he is in a lot of games anyway) and been released sold on the cheap after a year or so. He was never linked with City until this comment from his agent. Good decision to stay in Italy, he’s a hero for Napoli but he probably wouldn’t be getting a game at man city since most of the strikers in the known universe are on their books. Javier Pastore was also smart to turn down Real and Barca for the same reason.